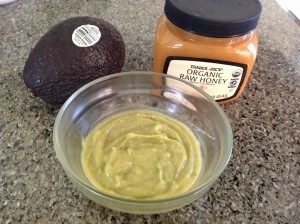 Mix * the avocado with the raw honey and apply to your face. (This can be used on your hair also, double the recipe) Leave it on for 15 minutes and rinse or better yet follow with this coconut scrub . You can make this in advance, the top layer will brown as avocados always do but it won’t hurt you or you could scrape it off. *You can do this with a whisk but if you want it really smooth use a food processor or blender.